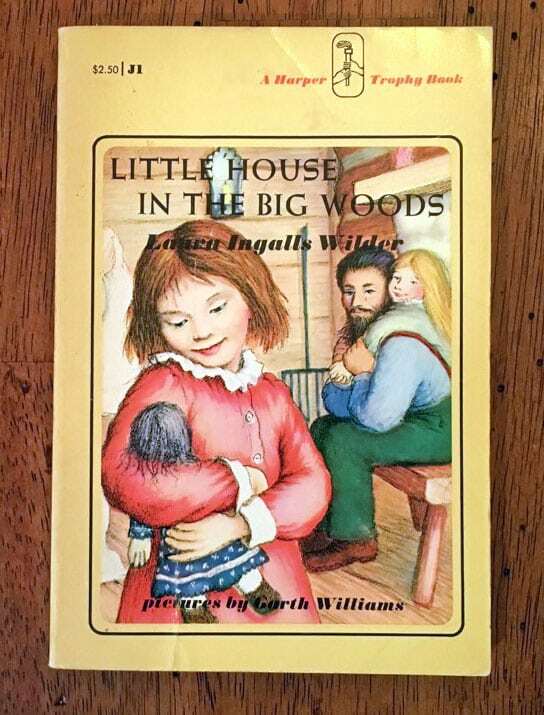 I opened that first book, Little House in the Big Woods, when I was 8 years old and instantly fell in love. The stories of Ma and Pa, Laura, Mary, Carrie, and Baby Grace absorbed all my waking hours as a little girl. It didn’t stop when I grew up, either. 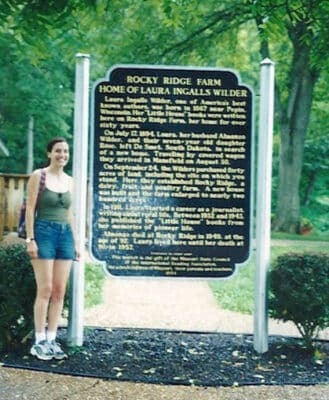 Several years ago, I dragged Hubby on a trip from California to Missouri to visit Laura and Almanzo’s home, Rocky Ridge Farm. 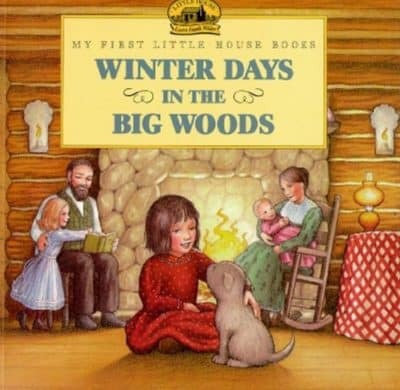 If you have a Little House fan or a Laura Ingalls Wilder aficionado on your shopping list this year, here are some gifts that are perfect for them! Did you know that there are 15 additional kids’ books written about Ma’s childhood–her mother’s–and her mother’s? They are called The Caroline Years, The Charlotte Years, and The Martha Years. Taken from family correspondence, they are written in a similar style to the Little House books we love, and carry the family history all the way back to Scotland. I have all of these books and was fascinated to learn about Laura’s heritage. She came from a line of amazing women! Also called a dutch oven, this is perfect for people who like to camp or cook outdoors. “Then Pa brought water from the creek, while Mary and Laura helped Ma get supper. Ma measured coffee beans into the coffee-mill and Mary ground them. Laura filled the coffee-pot with the water Pa brought, and Ma set the pot in the coals. She set the iron bake-oven in the coals, too. While it heated, she mixed cornmeal and salt with water and patted it into little cakes. She greased the bake-oven with a pork-rind, laid the cornmeal cakes in it, and put on its iron cover. Then Pa raked more coals over the cover, while Ma sliced fat salt pork. 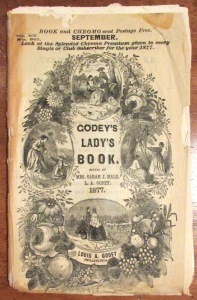 Hubby got me an actual, vintage Godey’s Lady’s Book on eBay (pictured). You can also buy hardbound and softbound reprints and get a peek at the current fashion and storytelling of Laura’s day. “Mrs. Boast had had a Godey’s Lady’s Book last year. If she had one now, it would decide the question. But Pa must cut the oats and the hay; they were all too tired on Sundays to make the long, hot trip to the Boasts’ claim. When at last Pa saw Mr. Boast in town one Saturday, he said that Mrs. Boast did not have a new Godey’s Lady’s Book. For the Laura fan who has everything…I’ll bet they don’t have a cheesemaking kit! “When the cows were milked at night, Ma set the milk away in pans. In the morning she skimmed off the cream to make into butter later. Then when the morning’s milk had cooled, she mixed it with the skimmed milk and set it all on the stove to heat. A bit of the rennet, tied in a cloth, was soaking in warm water. With a long knife Ma cut this mass into little squares, and let it stand while the curd separated from the whey. Then she poured it all into a cloth and let the thin, yellowish whey drain out. When no more whey dripped from the cloth, Ma emptied the curd into a big pan and salted it turning and mixing it well. These 14 books are perfect for beginning readers and those who can’t sit still long enough to listen to an entire chapter of Little House. The color illustrations are beautiful and the stories look just like I imagined them as a little girl. This would be a fun stocking stuffer. Be sure to put an orange and a penny in the toe of their stocking! They could not guess. But Laura felt something crackle in his jumper pocket and she pounced on it. She pulled out a paper bag, beautifully striped with tiny red and green stripes. And in the bag were two sticks of candy, one for Mary and one for Laura! 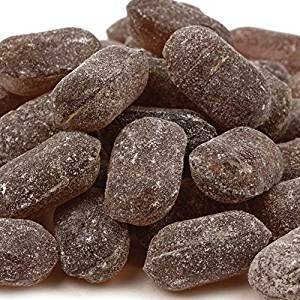 They were maple-sugar-coloured, and they were flat on one side. This treasury gathers all the Christmas stories from the series into one book. There are four stories about Laura’s family, and two about Almanzo’s. This would be perfect to pack away with the Christmas decorations and bring out for special story time each year. Have you ever thought about how difficult it must have been for Ma to keep everyone fed? It amazes me sometimes when I think that they probably never ate a banana; didn’t have pasta unless they made it; and only ate what they could grow or hunt. This book contains more than 100 authentic recipes of classic pioneer food, from pancake men to vanity cakes. I saved this for last, because it’s my favorite of all of these. The Little House Guidebook documents everything there is to see from New York to South Dakota that has anything to do with Laura Ingalls Wilder’s “Little House” series. Each chapter discusses the location of each “little house,” including places that Laura lived in but didn’t write about. Almanzo Wilder’s homes are also included. You can see photographs and read descriptions of what each place looks like now, how and when each spot was honored as a Laura Ingalls Wilder historical site, along with suggestions for interesting places to visit and stay. There you have it…a list of gifts that any “Little House” fan would love, written by a lifelong fan. 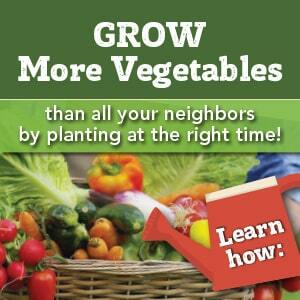 Have more gifts to buy? Check out this list of Gift Ideas for Your “Crunchy” Friend. Hi Pam! Our library has the Little House children’s books and we absolutely love them. They are short stories and illustrations based on the books.